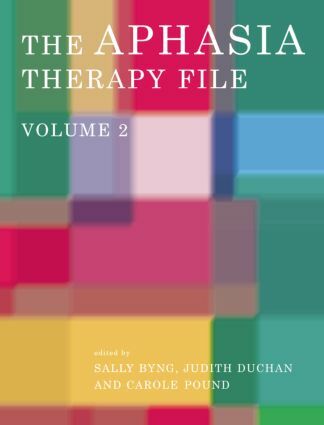 The Aphasia Therapy Files represent a practical resource for people who work with individuals with aphasia, either as therapists or as researchers. An overview of issues associated with current practices is combined with a study of the practicalities of determining, designing and implementing therapies. While each of the chapters is of considerable interest on its own, the final chapter offers readers a method of describing and capturing what happens in therapy and why, to enable comparisons between therapies and application by readers themselves. Written by speech and language therapists working in clinical practice, the studies included in this unique resource reflect the realities of everyday practice and will appeal to therapists, students and researchers in aphasia. S. Byng, J. Duchan, Describing Therapies for Aphasia. D. Cairns, Controlling Language and Life: Therapy for Communication and Identity in a Bilingual Speaker. C. Gatehouse, L. Clark, Re-Assembling Language and Identity: A Longitudinal Programme Involving Psycholinguistic and Social Approaches in the Life of a Young Man with Aphasia. D. Graham, Beyond the Simple Sentence Level: A Case Study of a Client with High Level Aphasia. J. Hickin, R. Herbert, W. Best, D. Howard, F. Osborne, Lexical and Functionally Based Treatment: Effects on Word Retrieval and Conversation. S. Mcvicker, L. Winstanley, A Group Approach to the Long-Term Rehabilitation of People with Acquired Head Injury within the Community. A. Montagu, J. Marshall, What’s in a Name? Improving Proper Name Retrieval through Therapy. L. Perkins, F. Hinshelwood, Symptom-Based Versus Theoretically Motivated Therapy for Anomia: A Case Study. C. Pound, Therapy for Life: Challenging the Boundaries of Aphasia Therapy. J. Robson, S. Horton, Replicating Therapy - More than Just More of the Same? C. Sacchett, J. Lindsay, Revealing Competence and Rethinking Identity in Severe Aphasia using Drawing and a Communication Book. S. Simpson, Respecting the Rights of a Person with Aphasia to Follow His Own Life Choices: A Longitudinal Therapy Study. A. Stirling, A Case Study of a Client with Mild Language Problems. J. Webster, A. Whitworth, Al: Accessing the Predicate Argument Structure. S. Byng, J. Duchan, A Framework for Describing Therapies and Discovering their Whys and Wherefores. Sally Byng is Chief Executive of the charity Connect — the Communication Disability Network. She was formerly Professor of Communication Disability. She is a speech and language therapist by background, and was awarded the honors of the Royal College of Speech & Language Therapists in 1992 for her contribution to research in speech and language therapy and the Order of the British Empire by the Queen in 2005 for services to speech and language therapy. Judith Duchan has published widely in the field of language acquisition, language pathology, and the history of diagnoses and therapies. . Her most recent book on aphasia is Challenging Aphasia Therapies (co-edited with Sally Byng). Judy can usually be found in Buffalo, New York, except during her annual visits to London where she consults on projects at the London Centre of Connect - the Communication Disability Network. Carole Pound is Director of Innovation and co-founder of the charity Connect—the Communication Disability Network. She has worked as a speech and language therapist in hospitals, rehabilitation and university settings, and was the first speech and language therapist to be awarded the Royal College of Speech and Language Therapists Sternberg Award for clinical innovation.